These are the Top 10 Bingo Sites picked by our experts here at best bingo websites - trust us, this is what we do! Our Top 10 Bingo Sites page showcases the very best bingo sites and is your guide to the very best online bingo bonuses, offers, promotions and exclusives available today. Our team of bingo experts work tirelessly checking the top bingo sites throughout the UK to find the top player deals available. We have reviewed, rated and tested all of the UK bingo sites and the results of this research, the top 10 online bingo offers we think will suit you are below. Looking for something different, then please get in touch or follow us on Facebook. First time depositors only. Min deposit: £10. Max offer: 200 Bingo Tickets worth £100 (100 Tickets (£50) on Street Party and 100 (£50) Tickets on Kaching) plus 25 Free Spins on a game of our choice. All winnings will be credited to your real money balance. Free Spins expire after 7 days. Promo code: GET200. Deposit balance is available for withdrawal at any time. Valid until 31.12.2019. General withdrawal restrictions & Full T&Cs apply. First time depositors only. Min deposit: £10. Max offer: Bingo Tickets worth £30 (on Street Party), Bingo Tickets worth £40 (on Big Bang) plus Jackpot Spins Voucher: (10) Jackpot Spins on Irish Riches JP, available 7-days from valid deposit date. Jackpot Spins win only the Progressive Jackpot, no other prizes will be awarded. Promo code: JACKPOT. Deposit balance is available for withdrawal at any time. Valid until 31.12.2019. General withdrawal restrictions & T&Cs apply. First time depositors only. Min deposit: £10. Max offer: Bingo Tickets worth £80 (£10 on Royal Room & £70 on Big Bang) plus 10 Free Spins (on Fluffy Favourites with winnings capped at £1). All winnings will be credited to your real money bankroll. Valid until further notice. T&Cs apply. No Wagering Requirements - EVER! First time depositors only. Min deposit: £10. Max offer: 200 Bingo Tickets worth £100 (100 Tickets (£50) on Street Party and 100 (£50) Tickets on Kaching) plus 10 Free Spins on Fluffy Favourites. All winnings will be credited to your real money balance. Free Spins expire after 7 days. Promo code: BIG100. Deposit balance is available for withdrawal at any time. Valid until 01.08.2019. General withdrawal restrictions & Full . T&Cs apply. 10 Free Spins are credited upon your first deposit, valued at 10p per spin and to be used on Babushkas slot. Winnings are uncapped and have no wagering requirement. Minimum deposit £10. T&Cs apply. 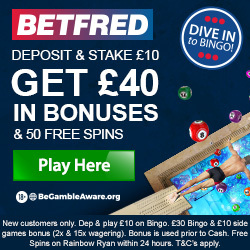 Deposit £10, Get 160 Bingo Tickets No Wagering No Max Win! First time depositors only. Min deposit: £10. Max offer: 160 Bingo Tickets worth £80 (80 Tickets (£40) on Street Party and 80 (£40) Tickets on Kaching). All winnings will be credited to your real money balance. Promo code: BINGO160. Deposit balance is available for withdrawal at any time. Valid until 30.06.2019. General withdrawal restrictions & Full T&Cs apply.